"Some 18+ years ago, my life wasn’t worth two cents, ya’ll. But I am living proof of what a little help and encouragement can do for a person." Albany, GA - June 24, 2008 -- "Who says you can’t come home again....I’m comin’ home, y’all! GraceWay Recovery Residence is my favorite 'hometown charity' because I love the fact that women find hope, sobriety, serenity, and wisdom here. I love how GraceWay provides 'a way out' of the affliction of their disease. Women are empowered to live in the 'solution' and not the 'problem'. I’m so encouraged by the resident’s courage and success. GraceWay 'treats' the whole family and everyone learns to live one day at a time. Miracles happen right here in downtown Albany, y’all!" 2007 Albany Chamber of Commerce Non-profit of the Year GraceWay Recovery Residence presents the Fourth Annual A Slice of Life with Paula Deen benefiting GraceWay events on Thursday, November 20 in Albany. "This year’s Silent Auction, Live Auction and new dinner show is exactly one week before Thanksgiving. We are delighted to expand the dinner seating so we can offer all Paula Deen fans an opportunity to participate and support our mission this year", said Susan Greene, GraceWay Board member. Last year, this GraceWay 'friend-raiser' was so successful that we sold all 500 spots to the dinner before we could even advertise or print tickets. Paula has agreed to offer her time and talent so as to double our blessing by performing a new show at the Darton Cavalier Arena this year. The November 20th event, A Slice of Life benefiting GraceWay - Food, Glorious Food features cuisine selections from Paula Deen’s recipes. Ms. Deen will entertain guests with a brand new show and will share her love of food, family and friends and celebrity experiences with the audience at the Darton Cavalier Arena. Paula’s Creative Director and Stylist, Brandon Branch will join Paula on stage and will dazzle the audience with his Christmas tree decorating expertise and his humor and the inside scoop on Paula’s recent adventures. A Paula Deen store will also be available on-site for purchases. Greene shared, "We are so grateful for the incredible generosity of our Silent and Live Auction donors and are still accepting donations from the community. Our professional auctioneer, Matt Holiday, promises to make this year’s auction even more fun because it is loaded with unique ‘experience packages’ so come prepared to shop and enjoy the convenience of your credit card purchases and Express Checkout." The charitable proceeds will benefit GraceWay to serve women and their families as they grow and recover from addictions, one woman, one life, one day at a time. The evening is sponsored by the stars of the show - our local Golden Ring Sponsors and Dinner Bell Patrons, local businesses and friends of GraceWay. Junior League of Albany volunteers and friends of GraceWay will staff the event. Advance reservations for tables of ten ($2000) and individual seats ($200) are available now by calling GraceWay at (229)446-4550. GraceWay is non-profit, faith-based, long-term substance abuse residential treatment community for women located on West Tift Avenue in the heart of downtown Albany. Debbie Mazur, GraceWay founder and Director states, "The essence of GraceWay’s phased program is the understanding that an alcoholic/addict’s best, if not only hope, for long- term sobriety is through directing her life toward a Higher Power. We utilize the Twelve Step methodology and study and apply the spiritual principle that underlies each step." GraceWay accommodates 15 women at the residence and is staffed 24/7 365 days/year. We also offer residents an option for sober-living in the The Way our transitional Apartments next door while they practice their new skills and work and /or attend school. GraceWay is a comprehensive long-term recovery community. In 2005, GraceWay Board President, Paula’s dear friend, Susan Greene aka "Bubbles" shared some of the miracles that were happening in the lives of these recovering women and their families and Paula couldn’t wait to see for herself. She and Michael and the boys traveled home to witness firsthand, how Susan said the lives of these recovering women and their families were being transformed as they journey to become productive members of their families and society. Paula Deen later shared, "As soon as I pulled up to that white picket fence of GraceWay, I fell in love with the pretty blue Historic Register Victorian, not far from my 'Aunt Peggy’s' house. My husband, Michael and I discovered my favorite prayer was painted on the GraceWay group room’s wall so we all prayed the Serenity Prayer together. Over lunch, Michael and I learned of the struggles to overcome addiction. These women are so brave, y’all. They are so grateful for this life-changing residential program. We heard heart-wrenching accounts of surrender, fresh starts, and renewed hope and health. As families and residents learn about addiction and the tools of recovery the whole family gets better and learns a new way to live life on life’s terms." GraceWay Director, Debbie Mazur says, "GraceWay’s offers afflicted women the sobering truth, time to experience the power of God’s mercy and grace and a working knowledge and practice of the spiritual principles of the Twelve Step methodology. Our program is about personal acceptance growth, change, accountability, responsibility and obedience and surrender to God’s holy will and call for your life. We applaud our community partners, businesses and faithful friends that have helped do God’s work here in Albany. It’s about putting hands and feet to your faith to help women and families in need of healing. On behalf of everyone at GraceWay, we thank Paula, her husband, Michael, sons, Jamie and Bobby Deen, Creative Director/stylist Brandon Branch and everyone at Paula Deen Enterprises and in the local business and church community for raising support and awareness for GraceWay’s ongoing program of hope." Paula Deen is the recipient of two Daytime Emmy’s. She is listed in Forbes magazine as one of the 2007 100 Most Powerful Celebrities. In addition, to her two shows on the Food Network, Cooking with Paula Deen and Paula’s Party, Ms. Deen is the author of six best selling cookbooks. 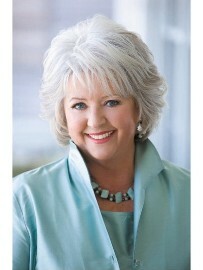 Her magazine, Cooking with Paula Deen is published by Hoffman Media and is #1 in its category. Paula recently launched her At Home - Livin’ It Up Southern Style dinnerware items and cookware. Call GraceWay at 229-446-4550 for more information or visit their website and read newsletters at www.GraceWayRecovery.com.